Just before CES, several manufacturers announced the introduction of a new wave of lower-cost 4K projectors in the sub-$1,500 range. Of course there would be some limitations, but just how good could they be? I did not expect to see lens shift and the quality of the image that I did on the Optoma UHD50 and the UHD51 for a few hundred more. The contrast, focus, color, and detail was truly amazing at these price points. These projectors were not shown on the show floor, but rather in a private suite in a nearby hotel. The UHD50, with its lens shift and very compact form factor, will no doubt find a new niche in the entry level 4K projector category. What is most amazing about both these new projectors is the use of RGB/RGB color wheels, which give them very rich and accurate color. The second feature of note is the brightness of 2,400 lumens. Considering this is a home theater projector, the real advantage of the extra brightness is, not so much larger screens, or the ability to use in less dark rooms, but the ability to more fully take advantage of the HDR content that is rapidly becoming more available. It is expected to ship almost immediately and will be followed up in early Spring by its black, and slightly more advanced, brother the UHD51. The Optoma UHD60 displayed very saturated rich color and contrast from a compact projector. The UHD51 was the real surprise, with the addition of three key additional features besides its more practical black case color. First, it includes the ability to do 3D Blu-ray discs at 1080P. Many people have built their libraries with 3D titles and now those titles can be used on this 4K projector. The second key step up feature is the more advanced processing engine, which includes motion compensation so even the fastest motion will be clear and detailed. The third key difference is the addition of Alexa voice control enabled. This was demonstrated by asking Alexa to change inputs, which functioned properly, along with volume control and on/off. There will be some additional, more advanced functions available at release sometime this Spring.The ability to control the projector, and some of its key features, will simplify and eventually even eliminate the need for an expensive custom programmed 3rd party control system. It will be interesting to see how these two new projectors stack up to the competition, but from what I could tell so far – they are off to a very good start. The Optoma UHD51 adds 3D, motion compensation, and Alexa voice control along with the black projector case. What do you think? 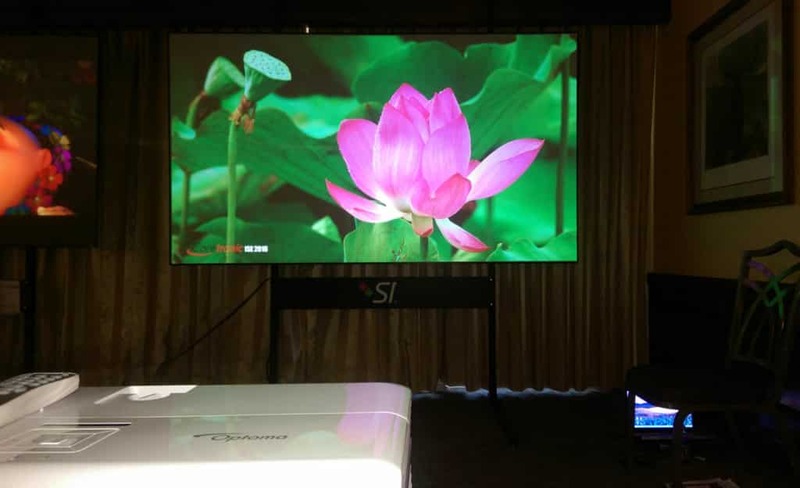 Do you think these new projectors will be as popular as their recent UHZ65, UHD65, and UHD60? This entry was posted in AV Solutions, Home Theater and tagged Alexa, Optoma 3D Projector, Optoma 4K 3D UHD51 Projector, optoma 4k projector, Optoma 4K UHD50 Projector, Optoma UHD50, Optoma UHD51.